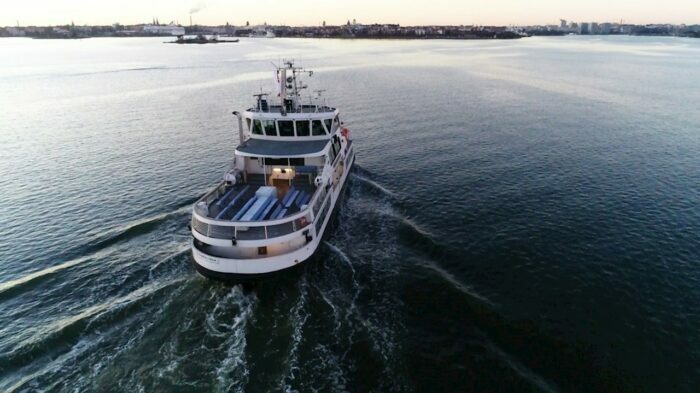 The Suomenlinna II was retrofitted with ABB’s dynamic positioning system. It is steered from a control center in Helsinki. Image courtesy of ABB. This week, I’m in Helsinki, speaking at an event. I’ll be telling a bunch of advertising executives how IoT will change their industry and after I’m done with the talk, I’ll likely include some version of it here. Helsinki and Espoo (which is roughly 20 minutes away) are both excellent cities, and offer a ton of ways to see IoT in action. I had wanted to take an autonomous ferry from Helsinki to an island that contains the Suomenlinna fortress, but it wasn’t out of beta yet. The ferry is built and operated by ABB. What’s most interesting about it is that the pilot sits in an office in Central Helsinki and remotely operates the boat as it nears each coast. He’s one of the robot whisperers I discussed in last week’s newsletter. I found a compelling use case for 5G in industrial factories courtesy of Marko Lepola from Telia. Yes, Telia is a carrier and thus, has a vested interest in driving the next generation of cellular standards. But when it comes to retooling factories on the fly, which is actually something that both ABB and Schneider Electric are experimenting with, wireless control of equipment makes sense. In the future, factories might be producing wares for different companies as opposed to a factory dedicated to producing a single or merely a few widgets. Or they might switch between producing different widgets much more frequently. So unlike traditional factory automation, where the robotics and equipment are fixed, in factories where retooling is common, gear needs to be able to move around. That means wiring sensors and equipment becomes impractical. In factories that need constant retooling, which are not common today, wireless makes sense, and the low latency and bandwidth offered by 5G make even more sense. In factories where products from different companies are manufactured, a 360-degree video system to monitor and analyze production offers the product design team a way to ensure high quality. This concept kind of blew my mind as it ties back to several trends I’ve encountered in factories. One is a consistent reliance on video analysis and in some cases, computer vision to allow companies to monitor their production floors and remove humans — or put those humans at a remove — from dangerous working conditions. Another trend is the centralization of specific experts. Instead of having someone who can operate a specific kind of equipment at any factory, some manufacturers want to place such experts in central locations and have them remotely monitor several factories at once. This is an especially popular idea in industries where recruiting new workers is difficult and a large portion of the workforce is retiring. Finally, companies that operate manufacturing facilities are experimenting with IoT to help change and customize their product mixes, demanding more flexibility from their equipment and agility from their operations. Having connected machines that are controlled via automation and whose maintenance and operations are monitored by connected sensors mean producers can essentially reprogram a factory on demand. If such a setup becomes more commonplace, having some kind of platform that allows remote experts to monitor the process makes a lot of sense. It’s not uncommon for product designers to spend months on the ground at a factory floor getting it retooled and optimized to produce a new device or product. I doubt all of that time could be spent monitoring operations in virtual space, but it could cut down on return trips or allow for spot checks during production runs. See, I get so excited about this that I just turned my entire essay that’s supposed to be full of a variety of notes from Helsinki into a discussion of this concept! There’s one more concept worth exploring, which also came from my conversation with the Telia folks, in this case Ville Virtanen, Spotify business & connected vehicles at Division X. He had read the quick exploration of different devices to monitor driving that Kevin wrote for the site and said he wanted me to think bigger. These devices plug into a car’s on-board diagnostic port and can track location, information coming from the car’s engine, and diagnostics, and they have additional sensors that can even notify a user if their car was hit. But Virtanen is building a connected car device at Telia called Sense that is more than just a consumer device. Using the Sense platform, insurance companies could access consumer data (with permission), municipalities and private parking lot operators could access the system to charge for parking (based on the actual time your car occupies a space), and the data collected across fleets of cars could be used by automakers or even city planners. I wrote about this concept a bit back in 2017 in relation to Verizon’s Hum device, but so far that’s a consumer-facing product and it’s not clear what Verizon is doing with the data, or if it wants to make the platform available to other companies. Telia does. And as someone who has six different parking apps on my phone for the various lots and cities I visit, I’d love to have a device that could handle it all for me without adding yet another one. That’s enough for now, but check in next week for more details about my trip — and a deep dive on digital twins. I found a compelling use case for 5G in industrial factories courtesy of Marko Lepola from Telia. Yes, Telia is a carrier and thus, has a vested interest in driving the next generation of cellular standards. But when it comes to retooling factories on the fly, which is actually something that both ABB and Schneider Electric are experimenting with, wireless control of equipment makes sense. That’s enough for now, but check in next week for more details about my trip — and a deep dive on digital twins.